"Gorp" redirects here. For other uses, see Gorp (disambiguation). "Scroggin" redirects here. It is not to be confused with USS Scroggins (DE-799). Trail mix or scroggin is a type of snack mix, specifically a combination of granola, dried fruit, nuts, and sometimes chocolate, developed as a food to be taken along on hikes. Trail mix is considered an ideal snack food for hikes, because it is lightweight, easy to store, and nutritious, providing a quick energy boost from the carbohydrates in the dried fruit or granola, and sustained energy from fats in nuts. The combination of nuts, raisins and chocolate as a trail snack dates at least to the 1910s, when outdoorsman Horace Kephart recommended it in his popular camping guide. 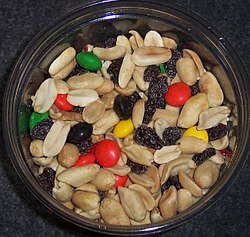 In New Zealand, trail mix is known as "scroggin" or "schmogle". The term is also used in some places in Australia but usage has only been traced back to the 1970s. Some claim that the name stands for sultanas, carob, raisins, orange peel, grains, glucose, imagination, and nuts or alternatively sultanas, chocolate, raisins and other goody-goodies including nuts; but this may be a false etymology. 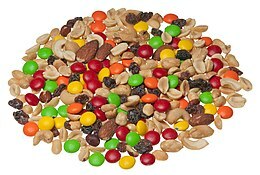 The American word gorp, a term for trail mix often used by hikers in North America, is typically said to be an acronym for "good old raisins and peanuts", or its common ingredients "granola, oats, raisins, peanuts," although the mix may contain M&M's and other nuts rather than oats and granola. The Oxford English Dictionary cites a 1913 reference to the verb gorp, meaning "to eat greedily." In Germany, Poland, Hungary, the Netherlands, Scandinavia, and several other European countries, trail mix is called "student fodder", "student oats", or "student mix" in the local languages. In Iran mixed nuts is called "ajil", eaten at festivals like Yalda night or just a social "mehmooni". Legumes, such as peanuts or baked soybeans. ^ Harper, Laura; Mudd, Tony; Whitfield, Paul (2002). Rough guide to New Zealand. Rough Guides. p. 1023. ISBN 1-85828-896-7. ^ "A walk in the Tinderry Mountains". The Canberra Times. 27 December 1975. p. 7. Retrieved 5 August 2013 – via National Library of Australia. ^ Wheeler, Graeme (1991). The Scroggin Eaters: A History of Bushwalking in Victoria to 1989. Melbourne: Pindari Publications. ISBN 0-9587874-4-1. ^ Moore, Bruce (April 2005). "From the Centre" (PDF). Ozwords. South Melbourne: Oxford University Press. 12 (1): 5. ISSN 1321-0858. Retrieved 17 February 2012. ^ "World Wide Words: Gorp". World Wide Words. Retrieved 2010-04-05. ^ "The Food Timeline-history notes: muffins to yogurt". Foodtimeline.org. Retrieved 2010-01-31.